3-D models of human ribosomal subunits based on PDB entries 3J3D, 3J3A, 3J3F, and 3J3B. 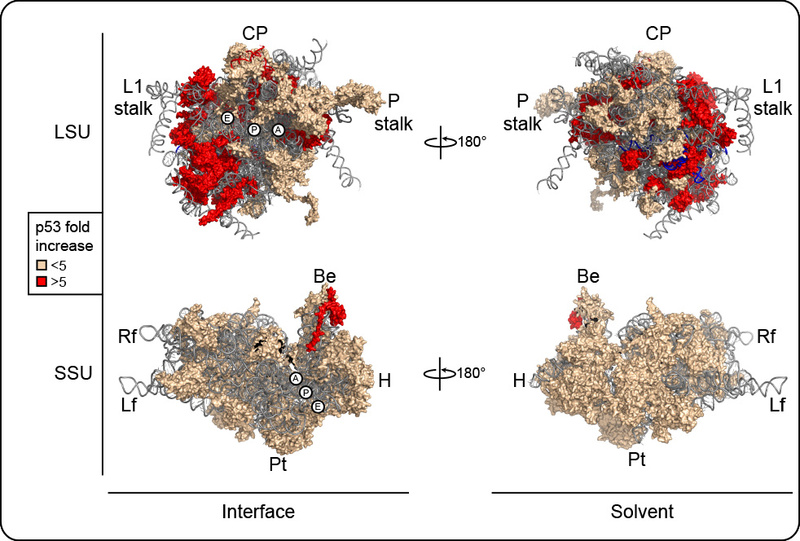 R-proteins are color-coded according to p53 steady-state accumulation. Left, subunit interface views; right, solvent exposed views. The aminoacyl (A), peptidyl (P) and exit (E) tRNA sites are indicated. Morphological features of the subunits are highlighted. On the LSU: the L1-stalk, the central protuberance (CP) and the phospho-stalk (P-stalk). On the SSU, the beak (Be), head (H), platform (Pt), body (Bd), lef foot (Lf) and right foot (Rf). The histogram shows r-proteins classified according to their impact on p53 steady-state accumulation. The nontargeting (Scr) control is shown in red, the RPS in green, and the RPL in magenta. The histogram bars are the means of triplicates with SD indicated. R-proteins whose depletion leads to a 5-fold increase in p53 levels are highlighted in a shaded box.